Well it’s been a great few years and pleasing to note that I’ve had views from nearly two thirds of the globe..so thanks reader especially the followers. You’ll see some other changes new pages etc, so hopefully it’s all new and improved, on the 19th, but as the first post was on the 8th I’ve posted earlier than usual. The story dates back to the seventh century. It involves St. Winifred, real name Gwenfrewi, was originally the daughter of a local lord, Tyfid ap Eiludd and his wife Wenlo, and after being taught by a monk called Beuno, her uncle, became a nun. However, Prince Caradog took a fancy to her and kidnapped her. However, she escaped and trying to reach Beuno was caught and beheaded by Caradog. Beuno cursed Caradog, who then disappeared. Where Winifred was beheaded the spring arose, however Beuno prayed over her body and she came back to life and ended her days as the Abbess of Gwytherin. There her grave was a pilgrimage site until her relics were removed to Shrewsbury in 1138. The first mention of the well is in 1093, when Haliwel was granted to Chester’s St Werburgh’s Abbey. By 1240, to Basingwerk Abbey had been granted it by the Welsh prince Dafydd ap Llewelyn. This established the link between the two sites and it was administered by the Cistercian monks until the Reformation. 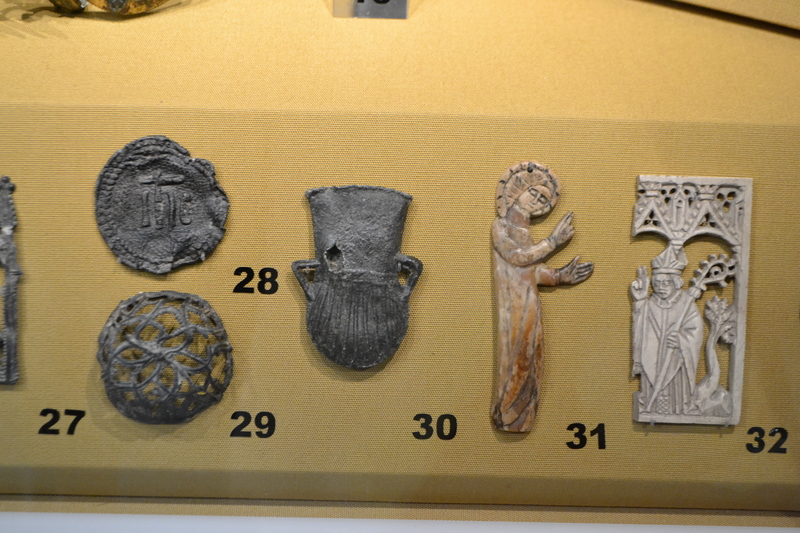 The fame of the saint and her well attracted many pilgrims, Royalty amongst them: Henry V, Richard III and Henry VII. It was the latter’s mother, Margaret Beaufort, who built the current prestigious well house and chapel and by doing so probably ensured it escaped destruction under her grandson Henry VIII. Evidence suggests that Catherine of Aragon was also a patron. Unsurprisingly, it became a location for Catholic resistance, the Jesuits, and even in 1686 James II and his queen visited to pray for an heir, before later exile. Its construction begun in around 1500 and took probably 15 years to finish. 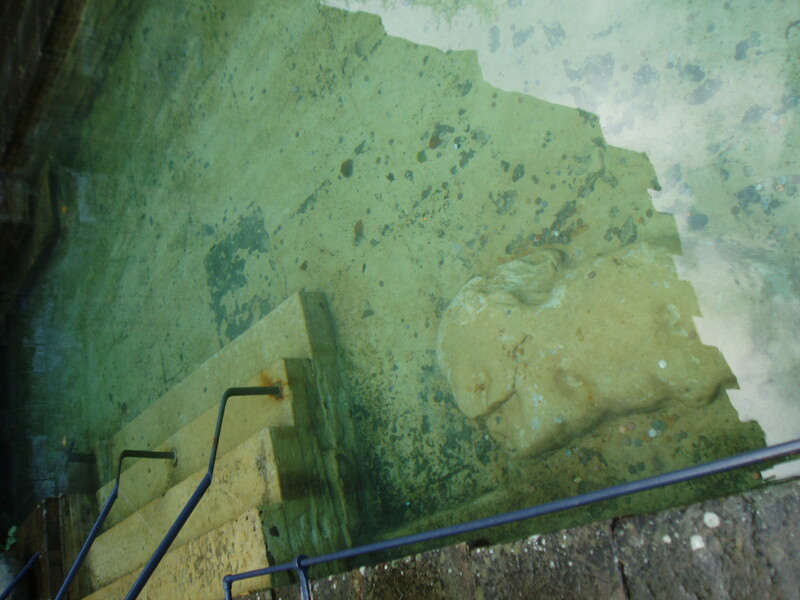 The structure consists of a star-shaped basin into which the water arises and flows into an oblong bath with steps either side. Originally reached from the chapel above, although this access is blocked, the structure is set into the hill side. It has a vaulted ceiling supported by columns with its Gothic tracery. The chamber is reached by a triple arcade entered from the north. The centre of the ceiling is a worn pendant showing the story of St. Winifred looks over the spring head. A niche to the side a statue of St Winifred, which replaced one destroyed in the 17th century in the 1886. Above the well chamber is a chapel full of carved figures. This has seen many uses over the years, such as a school or courthouse, is a simple single nave and side isle with an altar in the apse. An interesting feature sadly now gone was a red staining moss, called Jungermannia asplenioides which was said to be indelible stains of St Winifred’s blood. Another moss, Byssus jolithus was ‘St Winifred’s Hair’. This moss was dried, made into wreaths and sold in the 17th century for its healing qualities. 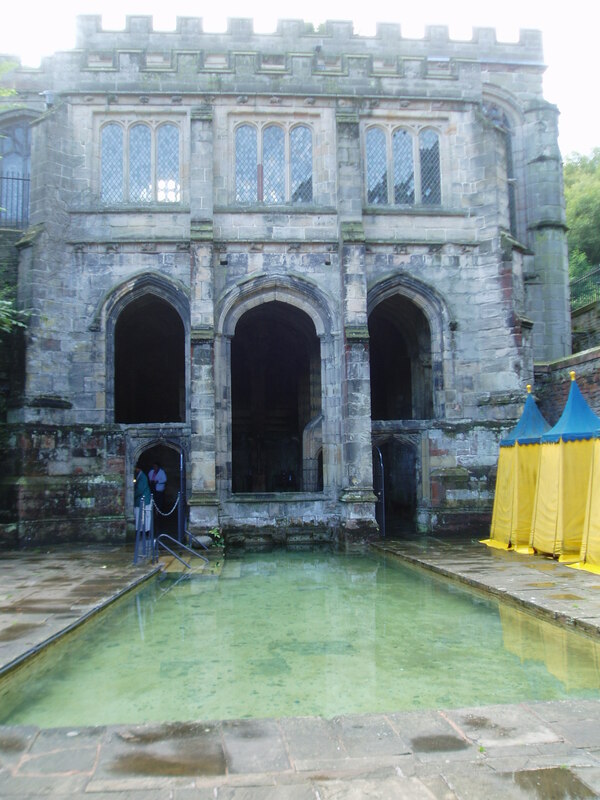 The ritual undertaken at the well is to pass three times through the small inner bath, saying the Rosary; the pilgrim enters the outer pool and prays on St Beuno’s Stone or Maen Beuno. 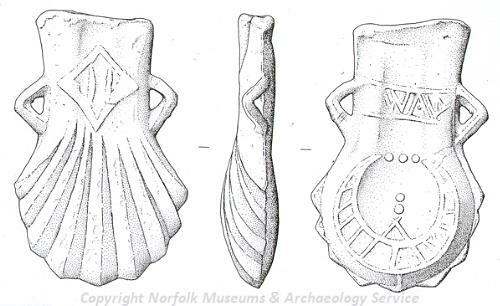 The stone as the name suggests is intrinsically linked with the legend of the well. It is on this stone that the Beuno was told that anyone who asked Winifred for help would receive their request by the third time. The stone is certainly very ancient and perhaps prehistoric in origin. What is also remarkable about the site is the catalogue of cures, graffiti around the well accords. Perhaps the most noted was that which occurred after a sick monk at Shrewsbury Abbey was told by a vision of the saint to say mass at the well. After this had been done, the monk began to recover, and went to Holywell himself, where his cure was completed. It was this Holywell cure which determined the Shrewsbury monks to adopt Winifred as their patroness, seeking out her grave, and removing her bones to their church in 1138. Until the 1960s the crypt was filled with crutches, these can now be found in the small museum. And so the cures continue.